I have a serious obsession with Buffalo sauce. I have no idea why or where it came from but I love it!!! I had some chicken drumsticks and decided to do a crockpot “buffalo wing” type dinner. Doing these in the crockpot is the easy way to do it but it doesn’t make the outside of the chicken super crispy like you’d find in a restaurant. No matter, still tasted great! It had all of the buffalo sauce flavor, but it wasn’t super spicy. Combine the ingredients for the spice mix in a small bowl. Measure out 1/2 cup of wing sauce. Pour a small amount of it into the bottom of a large slow cooker. 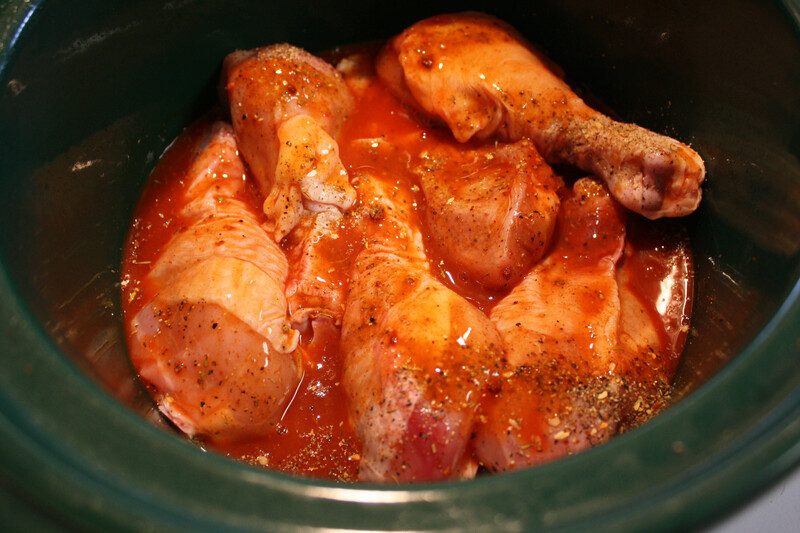 Arrange the drumsticks in the slow cooker (keeping them in a single layer if possible). Sprinkle with the spice mix and cover with the rest of the sauce. Shake the pot or stir them around a bit to coat evenly. Cook for 4-6 hours on low. If you will be out of the house for a while and will have the pot sitting on the "warm" setting for a while, set the timer for 4 hours. Remove the drumsticks from the crock pot. 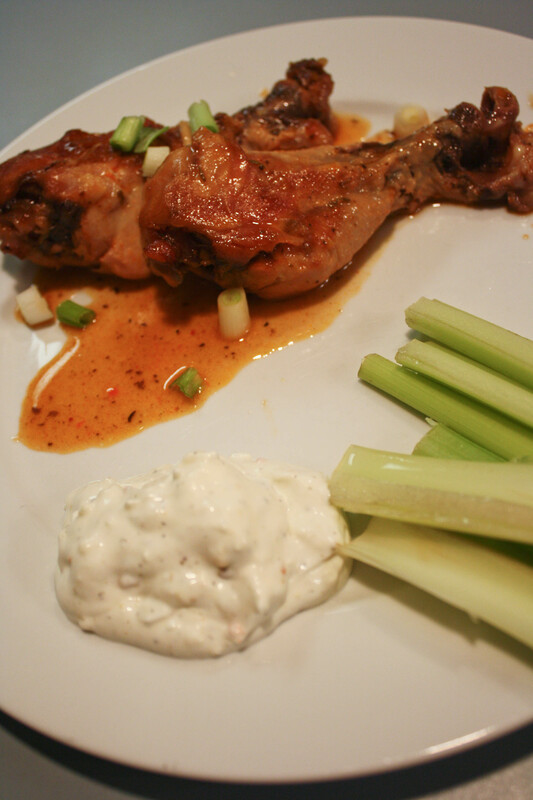 If using skinless drumsticks: Microwave the remaining 1/2 cup of wing sauce for about a minute to heat it through. Brush or spoon the remaining sauce over the drumsticks and serve. If using skin-on drumsticks: Adjust oven rack to upper-middle position. Place drumsticks, skin side up, on a wire rack set on a rimmed pan or a slotted broiler pan that has been sprayed or brushed with oil. Brush chicken with half of the remaining wing sauce (1/4 cup) and broil until skin crisps up and chars lightly, about 10-15 minutes. Flip it over, brush with remaining sauce, and broil for another 10-15 minutes. Serve. I was slightly disappointed with the drumsticks. Because it was done in the crockpot, the meat fell off the bone. Which is normally a good thing, but it made it less like hot wings and more difficult to eat. Also, I really wish the outside had been a little crispy. That would have been nice. I whipped up a blue cheese dressing using plain Greek yogurt, salt, pepper, Rogue River bleu cheese, a spoonful of mayo and a little cider vinegar. I mixed it all together and called it good. It was also perfect timing because I needed a quick dinner before meeting a friend. I like easy, crockpot meals when I don’t have time to cook! After dinner I headed out to meet up with a friend at The Loaded Brush. She saw my post last month and really wanted to try it! I had a coupon for a buy one get one half-off because of the last class I took, so I signed us up. 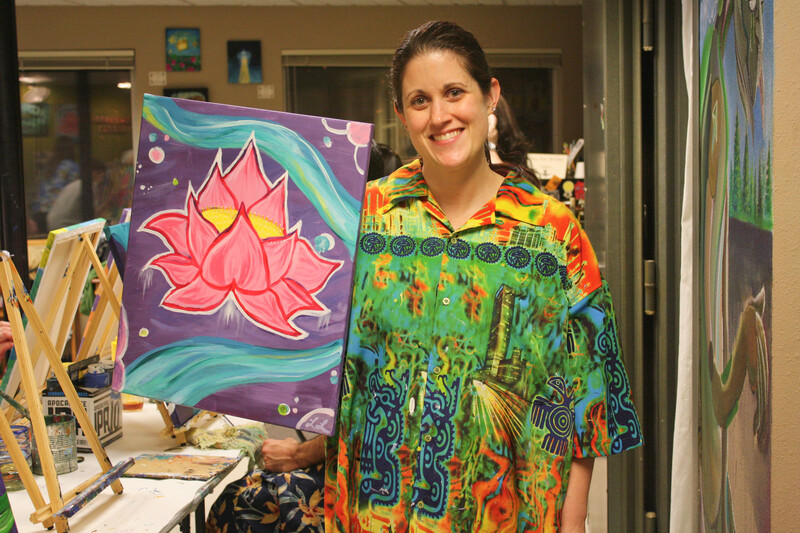 We picked the Lotus Flower class. 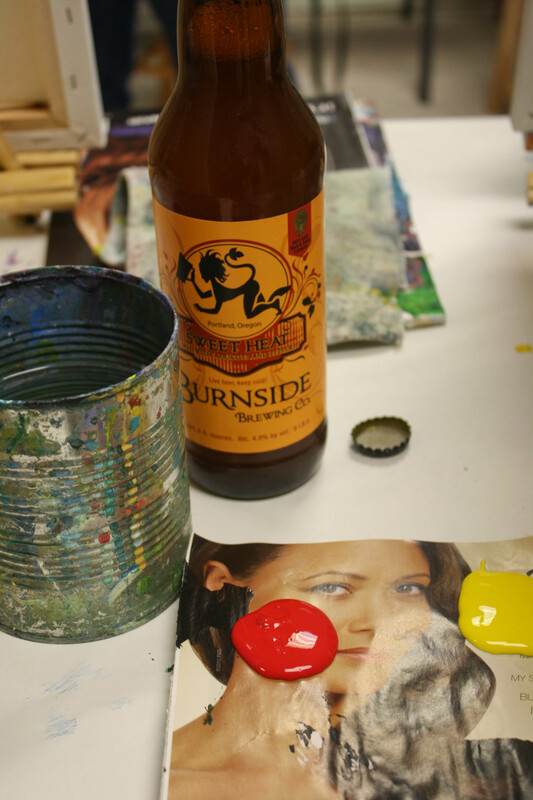 In previous classes we used yellow paint to make a guideline and the outline for the painting. 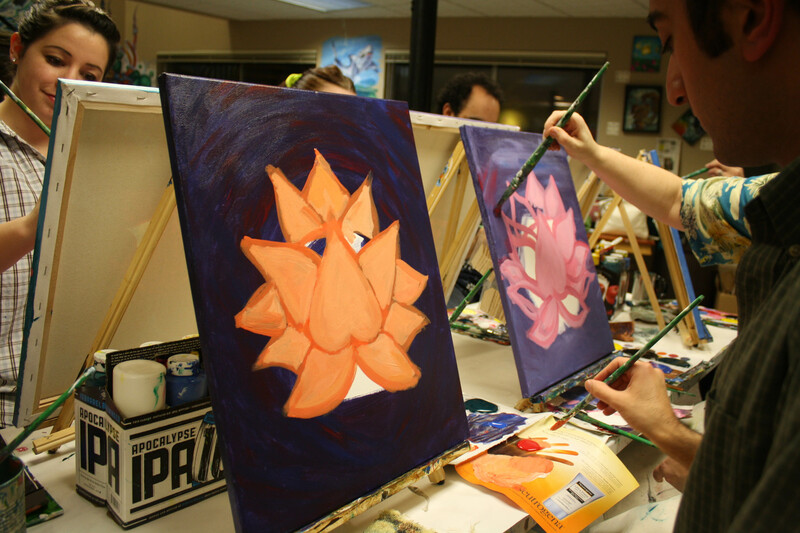 This class was different–it was also a different instructor. 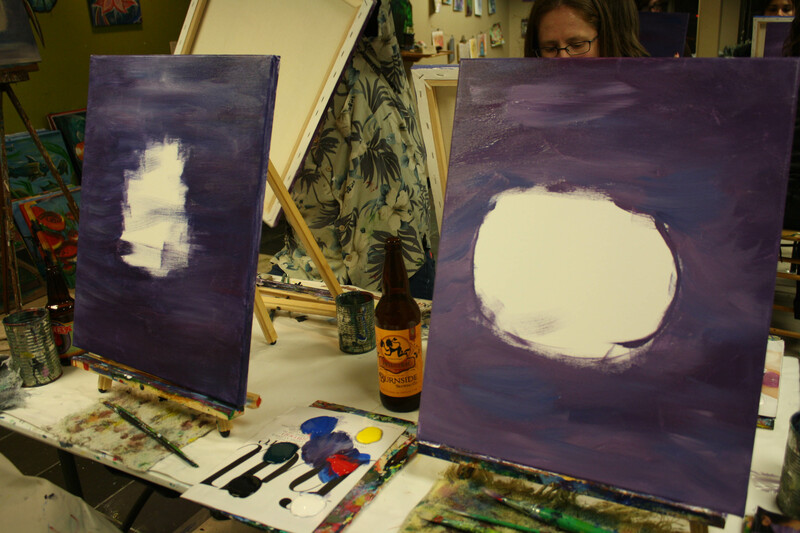 This time he had us mix up our background color first and paint the canvas leaving a spot in the middle. I made a mixture of medium purple. My friend Mindie made a dark, almost midnight, purple. Other people had different variations–some had magenta backgrounds, some had light blue, one guy did dark dark blue and an orange lotus. 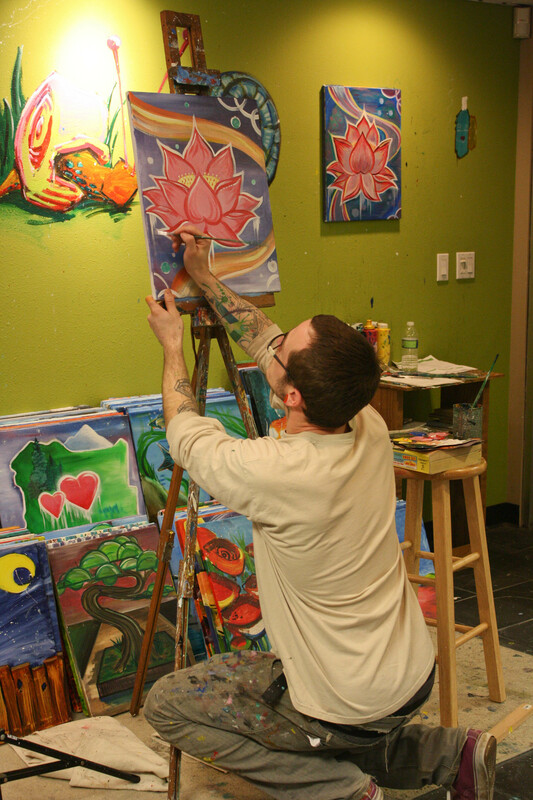 I really liked his orange lotus flower. 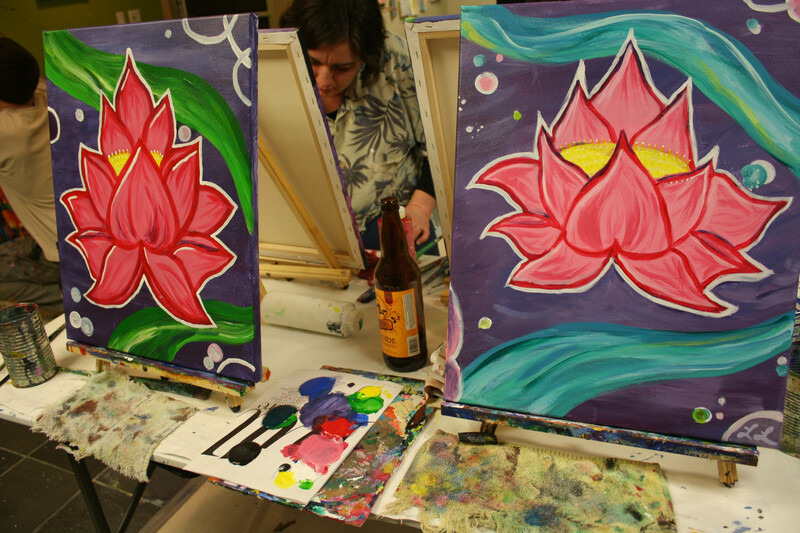 We outlined our lotus flowers with a dark pink/red color and filled in our lotus with a lighter shade of the pink. Then it was time to make the ribbon, which I saw more as a river. I’m really happy with my river. I like the color mixtures and the brushstrokes. The lotus flower was just okay in my opinion. 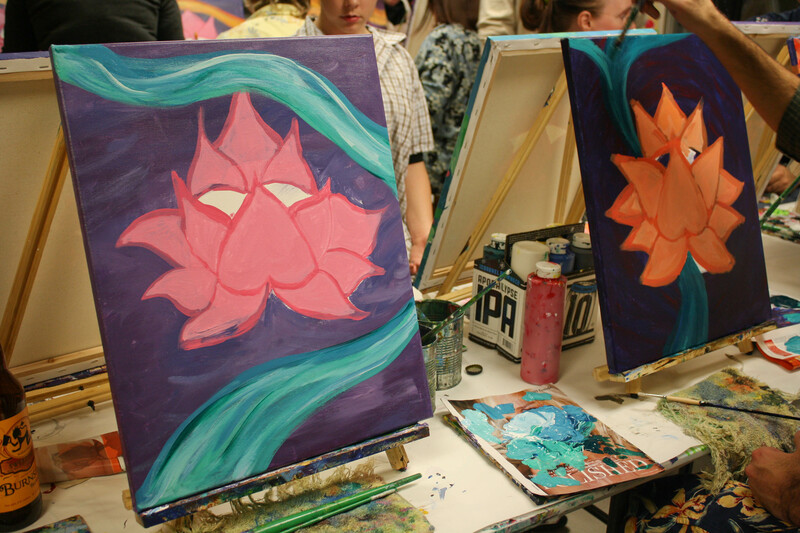 Mindie’s painting is next to mine on the left. I LOVED her bright neon green! It looks really cool. I love this recipe. I am going to try it next week. The paintings are amazing. Iowa Girl Eats has a great recipe on her site for a buffalo Mac and cheese. My husband has made it three times! I know you mentioned Michael has a go-to Mac and cheese recipe, but you might want to try this one too since it is spicy. Thanks for the tip. I will look for her recipe. It sounds amazing! I also love Buffalo sauce! I wonder if you had thrown your drumsticks on a cookie sheet and broiled them for a few minutes if that would have added some crispyness to it! One of my favorite buffalo sauce recipes is from paleomg.com and its her Loaded Turkey Stuffed-Twice Baked Sweet Potatoes (http://paleomg.com/loaded-turkey-stuffed-twice-baked-sweet-potatoes/). There is something about the spicy sauce with the sweet potato that is just divine! I hope you enjoy! Ooooh that potato sounds so good! Maybe if you popped the legs under the broiler to crisp up a bit? I love buffalo anything! I had this soup on my menu this week, but never made it – totally going to make it this weekend though! Good idea. I should have tried the broiler. I hope you make that soup recipe and write about it. Yum! 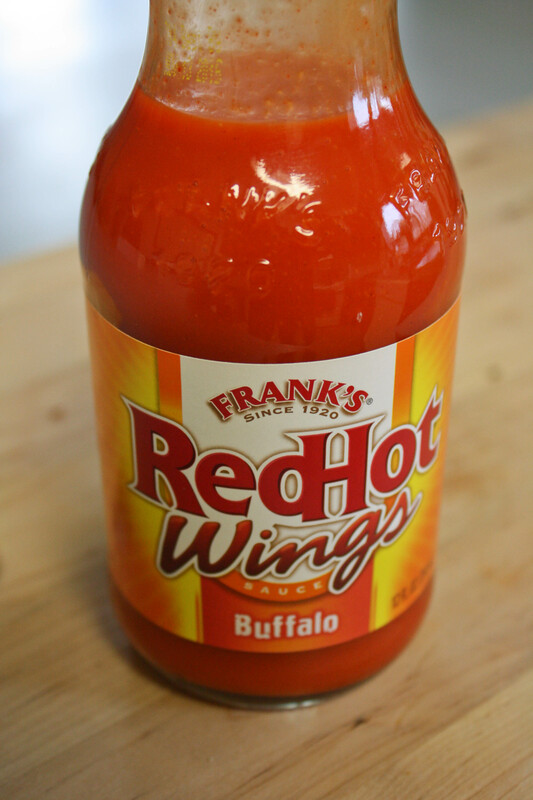 I love, love, love buffalo sauce! I put it on so many things. In fact, I have been known to just eat it off a spoon. My sister and I do that to the horror of everyone around us because they don’t like hot foods LOL! Well how about that. Coincidentally, I just bought 4 pounds of chackin’ wings earlier today. Gonna crockpot ’em up using your recipe this weekend. And I love your pic! You’ve got talent, girl!